Alex Trow’s Flamingo was chosen as the winner of Sanguine Theatre Company’s highly competitive Project Playwright Festival in January 2014. Sanguine is thrilled to return to IRT Theater for this world-premiere production. Flamingo is a romantic comedy that may be a romantic tragedy. Beneath it all is a deeper story of sexual awakening, gender expectations, and what binds people together. Frank, funny, heartwarming and heartbreaking, Flamingo is every wonderful and terrible relationship you’ve ever had. 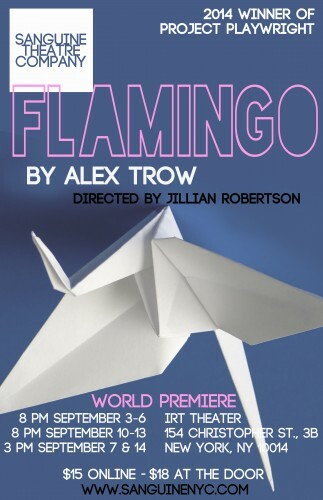 The cast of Flamingo includes Dylan Lamb (Alligator Summer, Dorothy Strelsin Theatre), Ian Antal (As You Like It, New York Classical Theatre), and Alex Trow (London Wall, Mint Theater). Jillian Robertson, director; Miles Mandwelle, AD. PERFORMANCES: September 3-6 and 10-13 at 8pm, 7 and 14 at 3pm. LENGTH OF SHOW: Approximately 1 hour 45 minutes with one 10-minute intermission. Alex Trow (Playwright) is a New York-based actor and now playwright. She’s appeared in London Wall (Mint Theater), The Detour (Metropolitan Playhouse), Scarlett Fever (New York International Fringe Fest), Stop Kiss (Sanguine), Owners (Yale Rep), and the hip new webseries Twenty Five. She received her BA and MFA from Yale. www.alextrow.com. Jillian Robertson (Director) – Jillian is a Brooklyn transplant hailing from Houston, TX. She has directed numerous shows over the past five years including: The Last Days of Judas Iscariot, The Drunken City, Bees and Lions (Sanguine Theatre Company), Come Back Up (Magic Time), and The Laramie Project (Under the Umbrella Theatre). In the Fall of 2009 she Assistant Directed A Piece of my Heart with the Emmy-nominated Lou Antonio. She received her BFA from The University of Oklahoma School of Drama with an emphasis in Performance in 2009. Jillian is a member of APO, and is also recognized as proficient in Unarmed and Single Sword Combat by the Society of American Fight Directors.